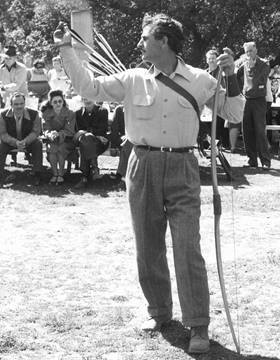 Howard Hill was an archer who was unofficially referred to as the "Worlds Greatest Archer". the bow and arrow and won many archery tournaments. 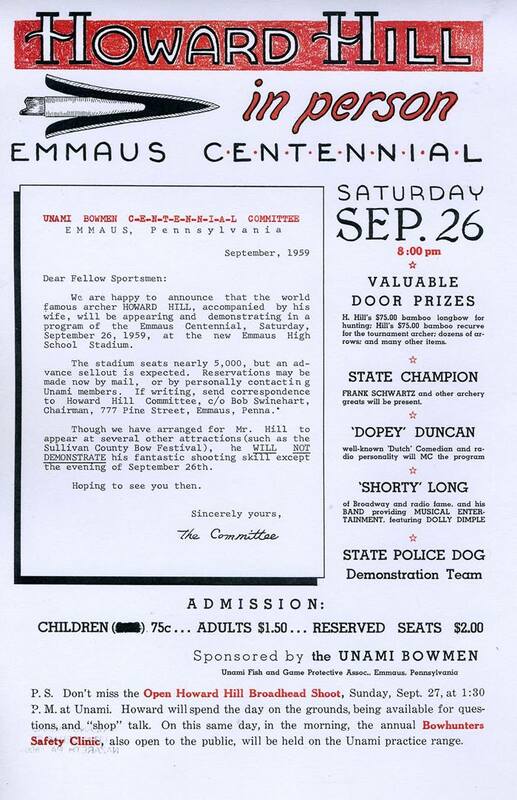 He was a performer who would do difficult trick shots like shooting an apple or even a prune off of someone's head from as far as sixty feet, and then would likely top that by shooting at an even smaller target from the same distance or maybe even longer. He put out several short documentaries on archery, often featuring himself performing other trick shots like shooting a flipped coin from a distance or splitting a rolling ball made of wood. He would also sit on the ground and push his bow with his feet while pulling the arrow back; even from this position he was able to hit the bull's-eye. 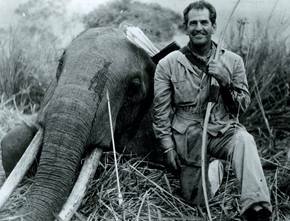 Howard with elephant he shot with bow while in Africa for the filming of movie "Tembo". The elephant weighed 12,000 lbs. and was killed by one arrow penetrating 31 inches into the animals lungs. 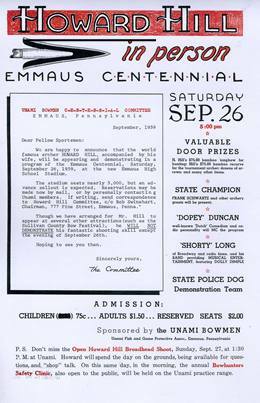 A 125 lb. bow was used by Hill. He excelled in all branches of archery -- Flight, target and field. 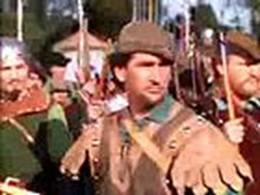 But it was his remarkable success as a hunter that most distinguished him from other famous archers in history. 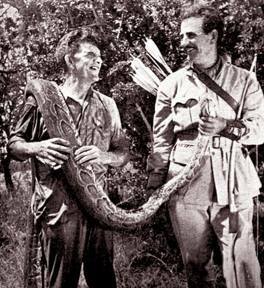 While on location in Africa during the filming of the Technicolor motion picture Tembo (circa 1968), he not only successfully hunted and shot lions, leopards and other wild beasts of the jungle, but his most sensational exploit was killing a full-grown elephant while armed only with his bow and broadhead arrow. 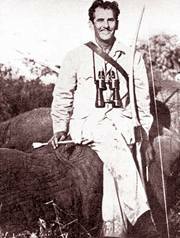 In Hunting The Hard Way, Hill revealed for the first time the secrets of his success -- the methods and knowledge which made him the worlds all-time greatest hunter with bow and arrow. 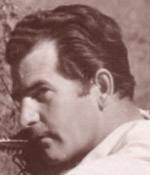 Howard was one of archery's early writers and his book Hunting The Hard Way became a best seller through the 1950's. 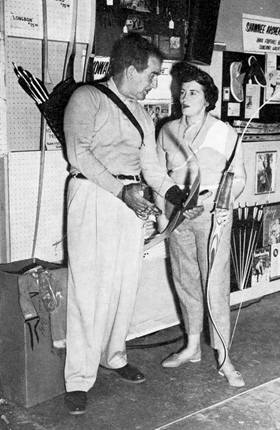 Through the 30's and 40's many movie shorts of his exploits hunting with a bow and arrow were shown at every movie house and showed his skills not only hunting many North American big game, but also his skill doing many skilled shots with a bow and arrow that covered everything from hitting aspirins in the air to many moving-type targets. 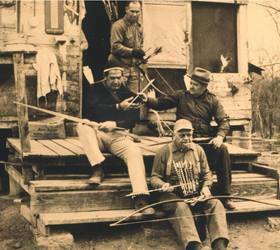 There is no doubt Howards archery activities started many a young man to take up the sport of archery. When you meet Howard Hill you know darn well you have met him before, but you can not remember where or when. Let me solve your problem. If, like myself, you sometimes find yourself hanging on a bar rail and staring over the head of the bar-tender, behind those character-destroying bottles of Four Posies or Old Step Mother, you will spot Hill. There you will see a reproduction of a painting, the cultural contribution of some beer cartel like Somebody and Rusch, depicting Custer's Last Stand. That American aborigine, that Indian on the piebald pony is Hill. Yes, the guy giving out with the blood­curdling war whoop, drawing a bead on the heroic general (if a bead can be drawn with a bow and arrow Hill is the one who can do it) is our boy. This is no quaint flight of fancy; It has to be Hill. God knows, I have stared at both Hill and his weapon often enough, chilled to the marrow. He calls himself a Cre, I think, and is inordinately proud of it, But he is a real Indian, make no mistake, as this Paleface knows. Confronted by Hill bearing down upon me over the bar on that pinto pony charging over countless hordes of Four Posies, I have always felt a keen sympathy for the unlucky Custer. 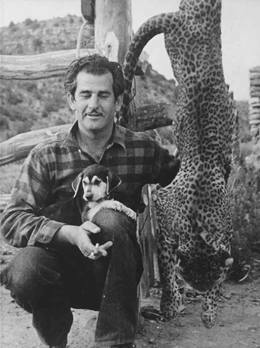 It is only our long and enduring friendship (based upon a mutual love for hunting and the Great Outdoors) that has induced me to write this foreword to his book, a thing I would do for no one else. As yet, being on a different continent from him at the moment, I have not had a gander at Howard's book, but I am sure it is a work calculated to bring out the best kind of savagery in American youth. The book is a cinch to stir many a nervous pulse as Hill has stirred mine in the past. It has to be filled with wild adventure. In it naturally, he will not tell you of the time we were out hunting mountain lions, and having just lassoed one, he had the frenzied brute screeching and turning somersaults at the end of a rope snubbed around a tree. Suddenly Howard yelled, "Here, hold this, and I did, only to find out that I had hold of the tail of the enraged cat instead of the rope. Nor, I suppose, will this savage recount another incident that occurred while we were hunting wild boar on Sana Cruz Island when he left me hanging on the side of a cliff several hundred feet above the rocky sea-shore. While he sat in safety fifty yards away, eating boiled eggs and going into sporadic gales of laughter, he watched me suffer the terrors of chronic vertigo, too petrified to move an inch. Yes, Hill is an Indian. Although no Indian myself, and having no claim to being perhaps even an exceptional hunter, yet I do have much in common with Hill. The wailing note of the loon floating across a placid lake, the distant high pitched cry of the timber wolf, the roar of the jaguar and the blood-curling cough of the charging wild boar, call to some deep inner response within us both that is not acquainted with modern civilization. "Cupid" Hill, as I have called Howard ever since we first met while making the picture Robin Hood, has done things with a bow and arrow that few have essayed with the rifle and I for one am going to read his book with great nostalgia, for some of the truly wonderful moments of my life have been spent tagging at Howards heels on our hunting trips in many strange corners of the world.